For accurate and rapid preparation of test pieces. Provided with an automatic clamping device, which means of clamping beam, holds sheet material firmly prior to the cutting action. We offer to our clients High Speed Steel Inlaid Guillotine & Trimmer Knives which are known for their sharpness and fine finish. These are manufactured using quality material and are specifically designed to meet the needs of pulp & paper industry and mills. We supply Semi-Automatic Paper Guillotine Cutter from our principals in China. All the Machines conform to CE Standards !! These is used cutting wire from 0-1.5mm to designed length. 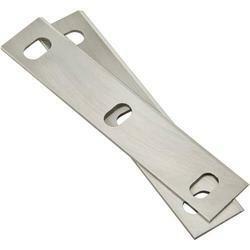 Wire Guillotine These is used cutting wire from 0-1.5mm to designed length. 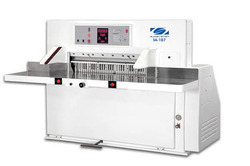 Paper Cutting Machine is a fully automatic & computer-controlled machine. Highly efficient in executing various cutting applications, these are known for attributes like safety, reliability, and accuracy. We have established ourselves as coveted organization, involved in offering Manual Guillotine Paper Cutter. With the great assistance of our qualified professionals, we are engaged in offering Guillotine Cutters & Straighter that are manufactured with high quality raw material in compliance with the global quality values. Our offered collection is shaped with a single aim of matching up to the toughest tasks and extreme conditions. Backed by a qualified team of engineers, we design quality ASEC Brand Over Crank Guillotine Shearing Machine. Suitable for heavy duty applications, these are provided with a nut bolted structure frame and tempered cutting tools. In addition to this, these machines are capable of flawlessly cutting crop bars, sections & angles, punch holes and plates.